KT British Labs Go On a Guided Hunt with Us! Go On a Guided Hunt with Us! We have exciting news for our customers in Minnesota and Texas. We’ve partnering with Butch’s Guide Service and the Southern Flyaways Guide Service to form Texsota Outfitters, a company that is dedicated to offering you guided hunt tours throughout Minnesota and Texas. Texsota Outfitters offers customers a five-star guided hunt experience, with the help of our talented British Labs, of course. The knowledge and experience of our guides, combined with the help of our British Labs, is sure to provide you with a fun and successful hunt. Through Texsota Outfitters, we offer goose and duck hunts in the mornings, and pheasant hunts in the afternoons. For customers in Texas, we offer a wide variety of duck and other waterfowl hunts in the Katy area. Plus, we’re now offering guided snow goose and sandhill crane hunts with the help of Butch’s Guide Service’s experienced guides. 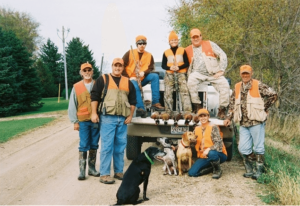 For our customers in the Sealy and Bay City areas, Southern Flyaways Guide Service’s experienced guides are helping to make it possible for us to offer all kinds of hunts in the region, as well. If you’re interested in booking a guided hunt in the Katy area, contact Butch’s Guide Service at 713-960-4318 to book your hunt. For hunters in the Sealy and Bay City areas, contact Southern Flyaways Guide Service at 979-324-5755. For those looking for hunts here in Minnesota, we have thousands of available acres to hunt waterfowl and pheasant within the daily bag limits. Texsota Outfitters’ hunts are in the greater Elbow Lake area, a scenic and serene region that’s perfect for bird hunting. To learn more about these hunts, call Kim Olson at 218-685-5103 or Britton Karisch at 832-326-6351. Experience the beauty of the Minnesota and Texas wilderness on a guided hunt, hosted by our experienced hunters and outdoorsmen – and our uniquely qualified British Labs. Whether you’re a seasoned hunter or hoping to learn the sport, our guides are here to help and provide you with a fun and successful time. For more information about our incredible British Labs, call us today at 218-685-5103.